CHFI-Computer Hacking Forensic Investigator Course can draw on an array of methods for discovering data that resides in a computer system, or recovering deleted, encrypted, or damaged file information. Computer hacking forensic investigation is the process of detecting hacking attacks and properly extracting evidence to report the crime and conduct audits to prevent future attacks. Computer forensics training teaches that computer forensics investigation is the process of detecting hacking attacks and properly extracting evidence to report the crime and conduct audits to prevent future attacks. 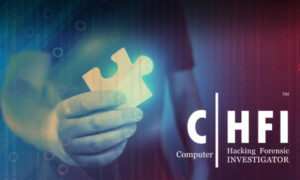 CHFI Training & certification provides IT professional with hands-on technical skills. Knowledge of TCP/IP & Networks.